I had a look on the web and the only solution has been to change impersonation settings from false to true in the web config. Unfortunately ours was already set to true and I still have this error. Cannot get the crawl to work in sharepoint now. Check the web application's website in IIS 7. Under Authentication, make sure ASP.NET Impersonation is ENABLED. Mine was disabled and caused this error. If you have applications in SharePoint that need this disabled, you might want to extend the web application it another IIS website and Disable impersonation for users, keeping the default web application's zone enabled for search crawls on that URL. Ensure this is set for each of the Web Applications that you wish to crawl. Another common Crawl issue is using an AD service Account that has not been added to the SharePoint Managed Accounts. I just want to make sure I never lose this information! "Exception: Microsoft.SharePoint.Administration.SPUpdatedConcurrencyException: An update conflict has occurred, and you must re-try this action. The object SPUpgradeSession Name=Upgrade-20110604-023550-824 was updated by Topgear\administrator, in the PSCONFIG (4272) process, on machine SharePoint2010. View the tracing log for more information about the conflict"
Later, execute following to initiate the upgrade process again. Note: If the upgrade fails with any errors re-view the upgrade.log file as it would contain detailed information to troubleshoot. Solution: Go to the Site Settings page for the root web of your site collection. Under the heading Site Collection Administration, click the Recycle bin link. On the QuickLaunch menu, select End User Recycle Bin items, then select all the items that appear and click the Delete Selection link at the top of the items list. Now select Deleted From End User Recycle Bin from the QuickLaunch Menu and do the same. Now return to the solution gallery and you should be able to deactivate and delete your solution. How to attach multiple files to a single list item, such as a Task List. Most people know about the “Upload Multiple Documents” option in document libraries. This option isn’t there with list items. What you can do is attach files individually. You can keep attaching as many files as you like. The files will now be listed in the “Attachment” section of your list item properties. SharePoint is not searching the content. If your Search Engine crawl is not returning any "Content" results from a Full Crawl, i.e. pdf, docx files are not being returned then you probably need to register the mssph.dll file. Note that PDF content searching will require Adobe iFilter. regsvr32 "C:\Program Files\Common Files\Microsoft Shared\web server extensions\14\BIN\mssph.dll"
Try Full crawl and it should work. Accounts used by application pools or service identities are in the local machine Administrators group. The message can be ignored, or can it? http://technet.microsoft.com/en-gb/library/hh344223.aspx. It only states since if you use an account in local admin group it gives that account the right to execute malicious codes without even prompting to execute. "The Server Farm account, which is created during the SharePoint farm setup, must also be a member of the Administrators group on the server where the User Profile Synchronization service is deployed." "Accounts used by application pools or service identities are in the local machine Administrators group. Using highly-privileged accounts as application pool or as service identities poses a security risk to the farm, and could allow malicious code to execute." Also grant the Replicate Directory Changes [http://support.microsoft.com/kb/303972] permission for the farm account. Reboot the server to make sure that all the services using the farm account run with the new privileges. As a SharePoint best practice, please refrain from using built-in machine administrator account for any SharePoint site app pools (services, application pools). This is due to the fact that Explorer view uses the WebDav protocol to connect to SharePoint from the client. As Windows Server is not designed to be a client, the WebDav client is not installed or enabled by default. In order to enable the WebDav client on a server,simply enable the Desktop Experience feature. Adobe PDF iFilter lets you index Adobe PDF documents in Microsoft SharePoint Server 2010 and Microsoft SharePoint Foundation 2010. Install the SharePoint prerequisites. To do this, run the Microsoft SharePoint Products Preparation tool. 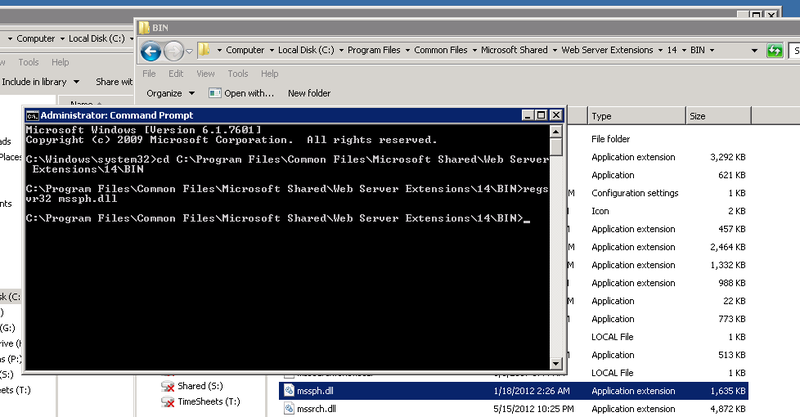 Install SharePoint 2010 and run the SharePoint Products Configuration Wizard. Configure a server farm topology. For example, configure a Single Server Farm. Create and configure a new Search Service application. on the Adobe Downloads website. Open the docIcon.xml file in Notepad. Note The docIcon.xml file is located in the \Program Files\Common Files\Microsoft Shared\Web Server Extensions\14\TEMPLATE\XML folder. Add the .pdf file type to the SharePoint content index. Click Start, type regedit in the Search programs and files box, and then press Enter. Right-click Extension, click New, and then click Key. Type .pdf, and then press Enter. Click .pdf, right-click (Default), and then click Modify. Restart all the SharePoint servers in the server farm. command after applying the Update!